Daily nursing procedures certainly have come a long way since the clipboard hanging at the foot of the bed. Now that medical carts have become more multifunctional as mobile workstations, the demand for peripheral options has dramatically increased. Modern hospitals need to ensure optimal functioning of their systems, most of which are computerized, while keeping staff turnover to a minimum. The purpose of including peripheral options on medical carts is to reduce the amount of wasted time hospital staff spend walking between patients’ bedsides and recording equipment. The most basic option is the onboard computer, thin client, or laptop. This may necessitate the following obligatory accompaniments: scanners, keyboard, mouse, printer, and possibly even a signature pad. What if you could add even more peripheral features to your existing medical cart design – features that would drastically reduce the amount of time wasted in critical emergency situations? Think of what adding an IV pole or a vital signs device would do to improve efficiency. Add to that having the ability to record patient vital signs information on the on-board system, and you can make life easier for all concerned, thus streamlining patient treatment. Bringing everything to the patient’s bedside enables staff to provide the most efficient and effective care, thereby hastening recuperation. Charging batteries can be a hassle for staff. What if you had space for two batteries on one cart? The result would eliminate any possibility of having expensive equipment standing idly by while being charged. It’s simply a matter of removing and replacing the depleted battery while the electronic system draws power from the charged one. Additionally, coiled or retractable power cords can set staff free from distracting entanglements. Organized cable routing will make sure there is no confusion of cables, which can pose a danger. For example, tangled cords could hamper smooth adjustment of cart components during needed height or position adjustments. Besides eliminating the inconvenience of having to go elsewhere to find a safe disposal point, immediate disposal of contaminated needles and other sharps protects your staff. This is where an on-board sharps container or trash container can come in handy. For patients’ (and staff) peace of mind, single-locking drawers are available for safe storage of patients’ belongings. Dual-locking drawers also are useful features on any medical cart to safeguard unwarranted access to medications. For ease of writing, tabletop extensions and chart holders are other possible options. Add to this the possibilities of an RFID device, magnetic card reader, barcode scanner, and even a document scanner, and you have enabled staff to complete their rounds efficiently. Even a mouse holder for convenient storage of the mouse between uses adds to the ways you can facilitate hospital operations. 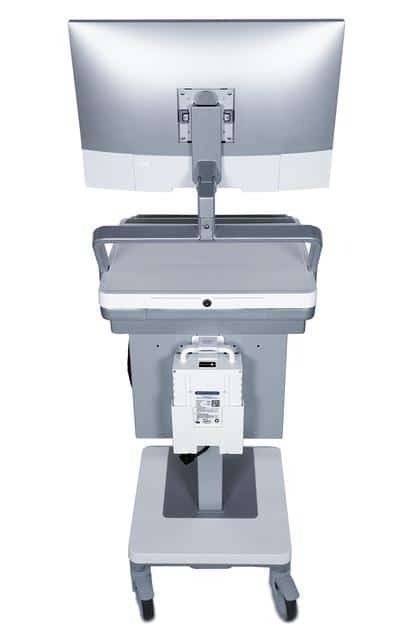 Computers already have been mentioned as something that could be added to existing medical cart equipment, and this poses the question of screens. Size and type will depend on your specific needs. Major computer manufacturers offer several possible options that can be mounted on medical carts, including desktop and laptop styles. Screens that may be added include standard and special monitors in a range of different sizes, as well as all-in-one computers and thin client devices. For more ease of movement and adjustability, you may elect to use a wireless mouse and/or keyboard, or even an optical mouse. Regardless of the peripheral options required for your fleet of medical carts, there are many to choose from. Remember that peripherals are improvements until they are superfluous. The process of finding the perfect combination to suit your hospital’s or clinic’s demands does not have to be confusing or hazardous. The key is to prioritize your most pertinent needs. Once this has been established, you can contact your local medical cart manufacturer and request a demonstration or a quotation. It would also be wise to ascertain in advance which options your suppliers have available so you already have a good idea of what would meet your specific requirements.